My hometown (pop. ~3500) library had, for reasons I have never learned, a respectable collection of Star Trek tie-ins. They may not have been the best food for a growing mind, but golly gee did I devour them. It was after I finished those and started resorting to Interlibrary Loan for more that the librarian essentially cut me off and started recommending some non-Trek sci-fi. I don’t know if she had an affection for the genre herself or if she just recommended things she’d seen on the shelves (I suspect the latter), but she put me on the right path. I don’t remember if it was Islands in the Sky or The City and the Stars, though. This failure to remember which was my first Clarke keeps me up some nights. Texans remember their first horse. Kids remember their first dog. Some of us remember our first library. 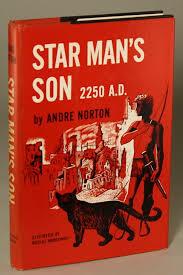 Incidentally, The City and the Stars is a re-write of an earlier book. Click Arthur C. Clarke on the tag cloud and you can’t miss the two posts on the subject. I read C&S in 1964 when the teacher/librarian I mentioned yesterday had to do a book report on it for a class he was taking at the local college, and passed it on to me. He was a great friend to me, but man was he lazy.